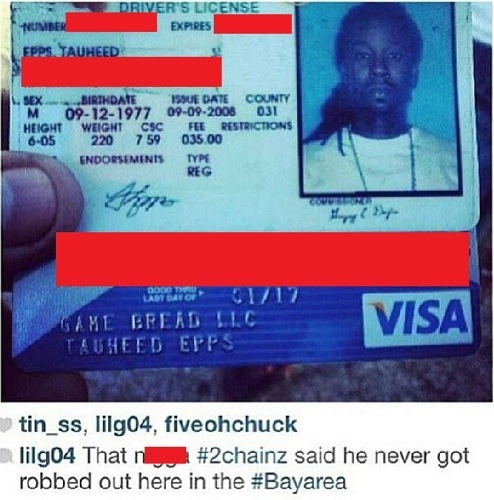 Before Video of rapper 2 Chainz robbery at gun point went viral, the rapper denied the claims because the robbers didn’t post the pictures of his valuables online… but now the photos have gone viral. The robbers may be caught in day now since photos of the rapper’s driver license and credit card were posted online for the world to see. The person that uploaded the images made sure to display the rapper’s address and credit card number. Lol Man he's not 47 Loll I'm actually a few days older than this guy! Who the heck woulda thunk that. Snoop Dogg the New C.E.O. Of Twitter?